Luis Bunuel’s ‘The Discreet Charm of the Bourgeoisie’ is what initially inspired Jo No Fui’s collection for winter. “That and the style of my mother” remarks the label’s creative director Alessia Giacobino. And while delving into her family archives, the designer rediscovered her passion for all things 60s and 70s – beaded shifts, crop tops, floor-skimming flares. The show featured yet another take on fur – a trend that’s been already making the rounds at shows this season – which here, added texture to multiple cuffs, collars and suede waistcoats. Crystal and sequin beading also made an appearace, bringing shine to the collection’s knitwear and silk tunics. Shades of brown, camel and burgundy permeated the first looks, but were later offset by the unexpected introduction of red and yellow. 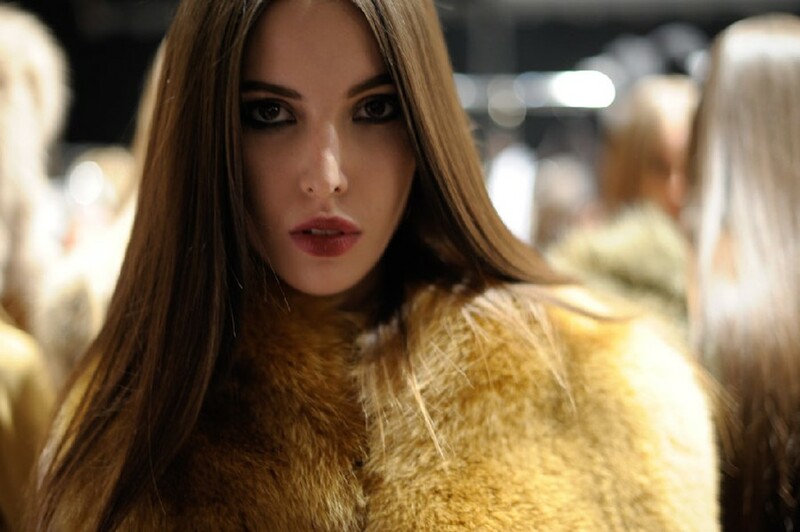 Highlights included beaded babydoll dresses, wool crop tops and the ever-popular duffle jackets lined with fox fur. Dazed Digital: Can you tell us more about the collection’s inspiration? Alessia Giacobino: I was looking at luxury in the late 60s and early 70s. Clean lines, long silhouettes and lots of fur! Alessia Giacobino: Yes, we used a lot of vintage beads and decided to combine them with silk and wool. The technique is quite original, so it’s like the case of “old meets new”.